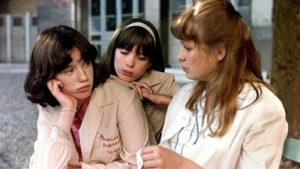 In the vein of such coming-of-age classics as Francois Truffaut’s The 400 Blows, the 1977 comedy-drama Peppermint Soda captures a particular moment in the tumultuous life and development of two young people. Anne (Eléonore Klarwein) and Frederique (Odile Michel) are teenage sisters in 1963 France, torn between divorced parents and struggling with the confines of their strict school. Along the way, they undergo an awakening both political and romantic. Diane Kurys’ celebrated first film – with cinematography by Oscar winner Philippe Rousselot (Fantastic Beasts)– returns from Cohen Media with a new 2K restoration to celebrate its 40th-anniversary. theatrical re-release in 2018, and Cohen Film Collection is proud to present this striking new restoration for home viewing.